These postcards were produced by the Rose Company between 1908 and 1910. These cards measure 3-1/2 x 5-1/2 (inches) are some of the most decorative cards of the pre war issues. These cards feature a player back and white portrait in the center of the card surrounded by an embossed gold frame. The players name and team are located below the photo. 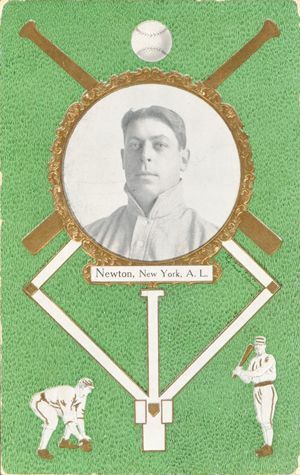 The background is green and includes baseball bats crossed, a baseball diamond and drawings of a baseball fielder and batter. The back of these cards contain typical post card info and include the TRC logo along the bottom. The above card is 2012 Helmar recreation based partly on the Rose Postcard design.